After fifteen years in a tiny West Village outpost in New York City, working for retailers like Banana Republic, Wendy Mink did something unexpected. She moved to open up a 500-square-foot Lower East Side boutique and it might have been the second best move she ever made. Her fusion of Victorian and East Asian design continues to grow as the designer has since earned spotlight attention in several prominent magazines. Mostly though, the attention seems to center on her boldest designs. But this winter we found simplicity to be among the best of her offerings, especially those that create an almost magical frosted blue. The framing of a blue topaz, the striking simplicity of a turquoise teardrop, the depth of a blue calcite oval; all of them mark a return to the basic shapes that adds the perfect allure against the backdrop of snow. It reminds me of the understated sensibility that Mink nurtured while working for the World Bank and traveling extensively throughout Southeast Asia. It's not just the East Asian flair that she found so fascinating. Rather, she focused in on the unique marriage between Indian and Victorian themes that emerged during the colony period. Her own work is influenced by India, Nepal, and Tibet. Three inspiring pieces that work long after winter from Wendy Mink. Blue Topaz Pendant Necklace. Blue topaz is generally thought of as December's birthstone but has been long regarded for its cooling and calming properties. What is especially striking about this specific piece is that it doesn't appear to be perfectly symmetrical. This small detail brings out the best of Mink's adherence to smooth but organic shapes. (Retails for $155). Ocean Apatite Drop Earrings. While most jewelers consider apatite too soft for mass distribution, the decision to present it as a teardrop makes it work. Since the gemstone (actually made up of three minerals) is more commonly available, it helps keep the price well within reach for anyone admiring the design. (Retails for $45). All of the jewelry is made to order, which requires up to three weeks delivery time (so orders won't make Valentine's Day). However, one of the many interesting aspects of Mink's work is that every stone, bead, and charm is made by the hands of Tibetan artisans in her Tribeca studio. These highly skilled women have been the cornerstone of Mink's quality since the very beginning. In fact, not much has changed since Mink found herself inspired to become a designer. Despite working for the World Bank, she has always been interested in organic patterns as they appear in nature, even while studying art in college. In making about five new collections every year, Mink also collects postcards, art, and even tote bags from all over the world. These collections often inspire her unique color palettes. Wendy Mink Jewelry In Blue Crystalizes At 7.2 On The Liquid Hip Richter Scale. Like anyone who appreciates great design, I find the effort Mink put into the designs by immersing herself in the culture while studying in Nepal and other nearby countries to be inspired. From a guy's perspective, her pieces work because they are beautiful but don't detract attention from the woman you might make the purchase for. Mink's signature pieces are an ever-chaging array of beautifully crafted jewelry and typically found in boutiques like Nanette Lepore, Liberty of London, and Barneys of Japan. You can find the pieces mentioned in review at Charm & Chain, which has an entire section dedicated to Wendy Mink. While you are there, spend a moment browsing the vintage jewelry section there too. It might even make for a separate review. 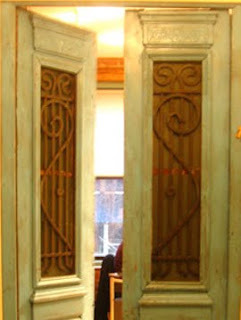 Image (Top): Egyptian doors at the Tribeca studio.